The appearance of words in Meredith Monk’s work can be rather jolting, as it is so easy for one to get used to the lack of semantic footholds. Like few other vocalists (Elizabeth Fraser comes to mind), Monk grinds the surface of what is being conveyed to such a fine patina that quantifiable meaning is often no longer necessary. Her vocal ramblings are mimetic, purposeful. Monk ably switches between registers and modes with lightning precision, creating a veritable conversation in and through a single body, gazing in multiple directions in the same breath. 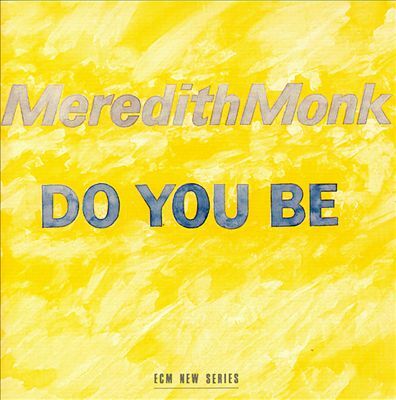 Do You Be is a Meredith Monk hodgepodge culled from an assortment of operas and theater pieces. As such, it contains more in the way of quantifiable semantics. So what, what do you know? What, what do you know? and variations thereof. She seems to inhabit the edges of these words, picking at their scabbed edges until those membranes join the dust of countless expelled breaths. “Window In 7’s” comprises a brief interlude, a linear narrative upon a road that is freshly paved, yet which also retains all the old potholes and cracks that its travelers remember so well, and along which we proceed with the regularity of a printing press. “Double Fiesta” abounds with sublime vocal reflections. A second piano joins the first, playing a staccato note that becomes almost indistinguishable from Monk’s voice as it punctuates the audio landscape like a Morse code signal. Monk laughs, but musically—that is, in accordance with a predetermined time signature. She lowers herself, only to rise higher with each recapitulation. Amid a series of motives, she leans back and laughs. And with this the pianos build to a crescendo and release. The next piece is our title track and is excerpted from Vessel: An Opera Epic. “Do You Be” ululates and runs around in frantic circles. As with much of her earlier work, Monk plumbs the depths of communication. As Monk so brilliantly demonstrates time and time again, after the rather startling aphasia that lulls us into this unusual sense of communion, when hearing language in its more standard form, even the most innocuous asides take on fresh meaning. “Panda Chant II” is another a cappella round. Perhaps a distant cousin of the Ramayana Monkey Chant, it similarly recreates the chattering of lush forestland. “Quarry Lullaby” is our only selection from Quarry, and opens with a plaintive male voice, joined in unison by a female one, and still by others in counterpoint. The piece builds to a fine display of extended vocal techniques. As the dirge ends, it lays itself bare to a strange animal rhythm, the complexity of which lies in the open spaces that it leaves unbreathed upon. We close with two more selections from The Games. “Astronaut Anthem” inhabits, as its title would imply, the depths of outer space, reaching us only through a sort of dynamic motionlessness, like that of a comet in the sky. It unfolds with the resonance of medieval polyphony and is certainly the most “atmospheric” piece on the album. Its resplendent harmonic twists and soaring sensibility; its confluence of title and musical expression; its closing sirens that hurtle themselves into the ether with the force of rocket propulsion—all of these elements make for a mystical experience. For the final “Wheel,” the listener is fed on bagpipes and a linear vocal line. It is a fitting closing that proceeds like end credits rolling over characters’ faces in freeze-frame. Memories still move among us, but we know the story must end. Accepting this end, we find great beauty in the solace it promises. The bagpipes summon shrill breath, even as the vocal after-effects linger with the assurance of something that will outlive us all. Listening to this music we might swear we’ve heard it before, for it may very well tap into something familiar but hidden, something intimately touched by the promise of singing and sealed by the taste of mortality. I’d love to review this. Do you have review copies? Excellent review, and I greatly enjoy this album, but it is no longer available on Spotify in the US. What gives? Please bring it back. Thank you so much for the corrections, Michael. I’ve made them, accordingly.